The Shetland Sheep dog, or ‘Sheltie’ as it is affectionately known, originated from the Shetland Islands where it was used by crofters as a sheep dog. Few Shelties are used today for their original purpose as sheep dogs, but those people who have worked them vouch for their incredible stamina and instinctive ability to herd. Often referred to as a miniature Collie, the Shetland Sheep dog certainly has the overall appearance of the Rough Collie, however, it is a breed in its own right and possesses some minor distinguishing features, apart from the obvious size difference. 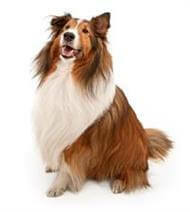 Although rather a small dog, the Shetland Sheep dog is certainly not fragile. When feed was in short supply on the farms, the original Shelties were ferried on to small outlying islands with a flock of sheep and left for long periods to guard the flock and fend for themselves. Only the hardy would have been able to survive. When brought back to the farms after such isolation, the dogs would thrive on attention and affection. It is probably this part of their history that makes them so devoted to their owners, but suspicious of intruders and intent on protecting the family. Excellent. It can live happily with the family cat and will get along with most other dogs. The Shetland Sheep dog's glamorous jacket requires surprisingly little attention. A brush and a comb behind the ears each week will keep it in good condition. The breed's double coat enables it to adapt to both hot and cold weather, the second layer (undercoat) giving insulation against both heat and cold. While the Shetland Sheep dog is certainly capable of barking, it is also smart enough to be trained not to bark unnecessarily. It makes an excellent watchdog and will alert you to visitors or unusual occurrences. Almost anyone will benefit from owning a Shetland Sheepdog. The ideal owner is someone who understands the need for occasional grooming.